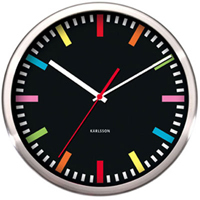 Established in 1999, the Dutch brand Karlsson has grown to become an internationally recognised clock brand. Karlsson Clocks are synonymous with good quality, stunning graphics, aesthetic and minimalist shapes and innovative design. This is the result of the unique collaboration between national and international designers, together with their own creative team. So for a contemporary time piece for your home or office interior, go no further.